I’ve been absent from the blogging world for a while, waiting for my laptop with all of my blog photos to be repaired. I can’t keep waiting so have commandeered the hubby’s laptop. It will be tricky to share one and may mean fewer blog posts than I was doing before, but my waistline really needs a break from the amount of heavy blog cooking I was doing anyway. Hopefully things will lighten up all around now that summer is finally here. This dish was created as a result of an Edible Tapestry Facebook page comment that my aunt made several months ago concerning a Low Country Boil, an idea which has been taunting me ever since. 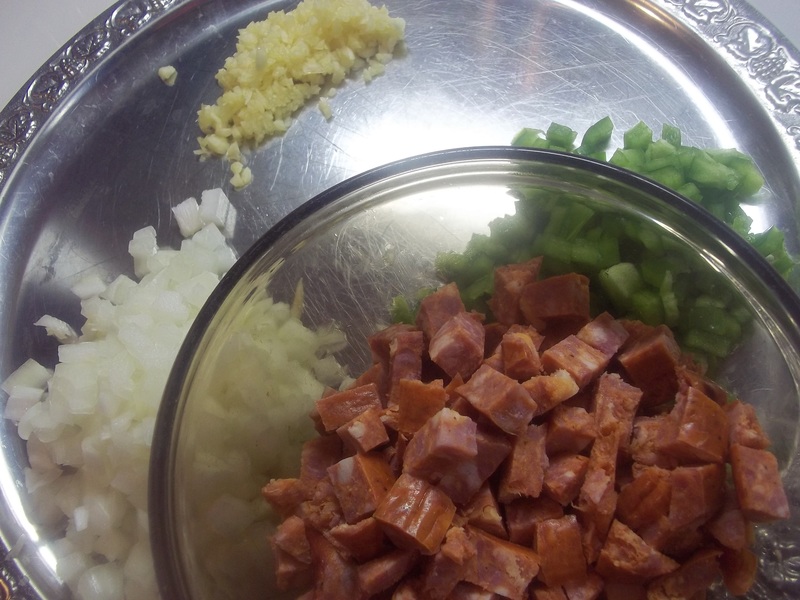 When I saw precooked crawfish, or mudbugs as my aunt called them, in the grocery store and my boys flipped out asking if we could please buy them, I put them right in the grocery cart and proceeded on a hunt for andouille sausage. 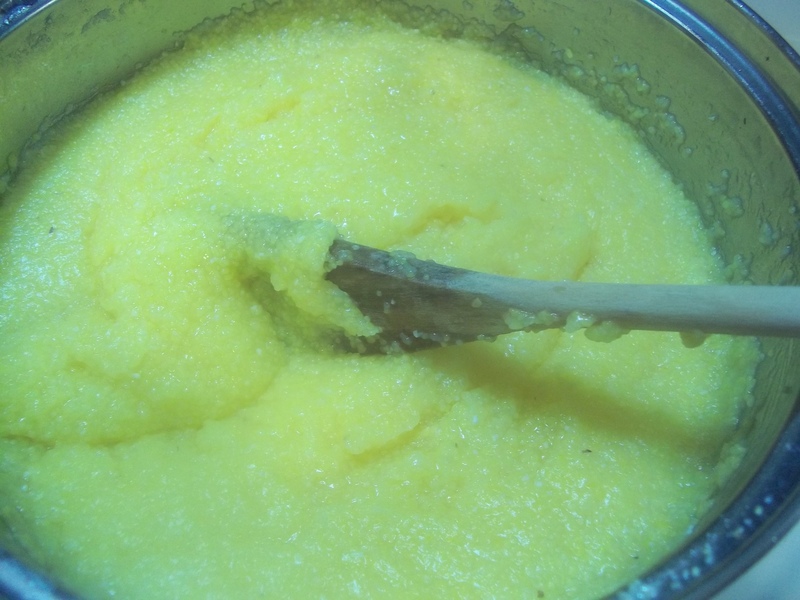 Yellow grits, the big granular kind you find in the health food section, were the obvious accompanying ingredient. 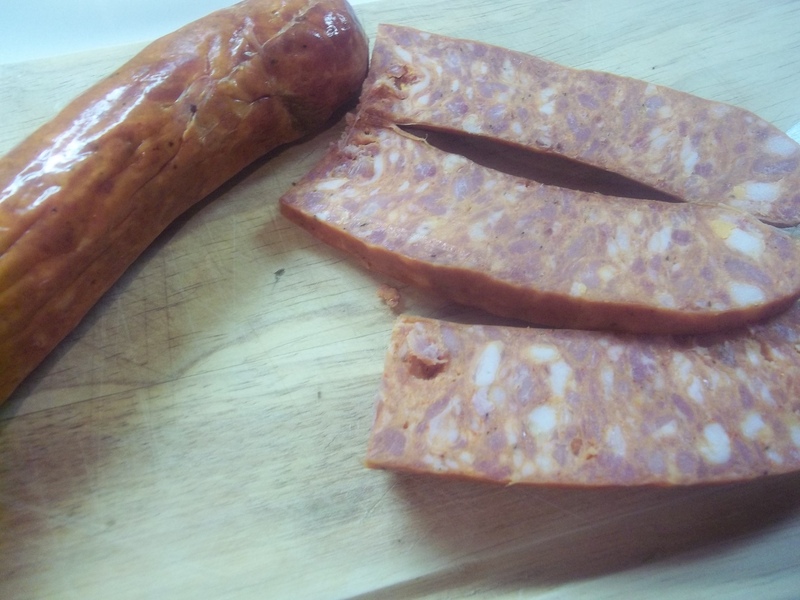 I was surprised to find Johnsonville Andouille sausage in my local supermarket. Happy that I wouldn’t have to search far and wide through the Southern Appalachians for andouille, I decided to give the links a try. They added just the right flavor to take my crawfish dish to the Gulf, or make it feel like it had come from the coast, anyway. 1 1/2 c. stock, I used chicken because that’s what I had on hand. Prepare the grits according to the package directions and keep warm. 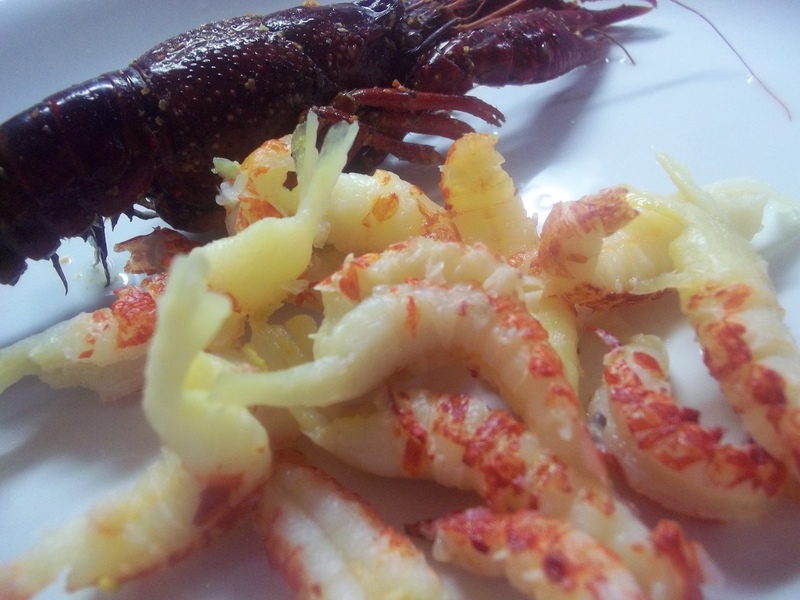 Remove tails from the crawfish and peel them. Remove the black vein that runs down the tail and discard. Set cleaned crawfish aside. 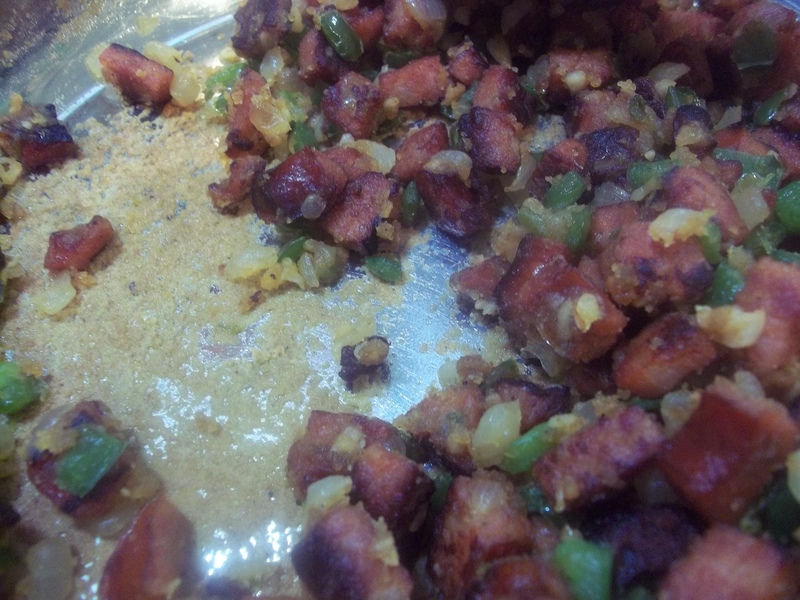 Cook sausage in the bottom of a skillet slowly to render fats and brown to golden. 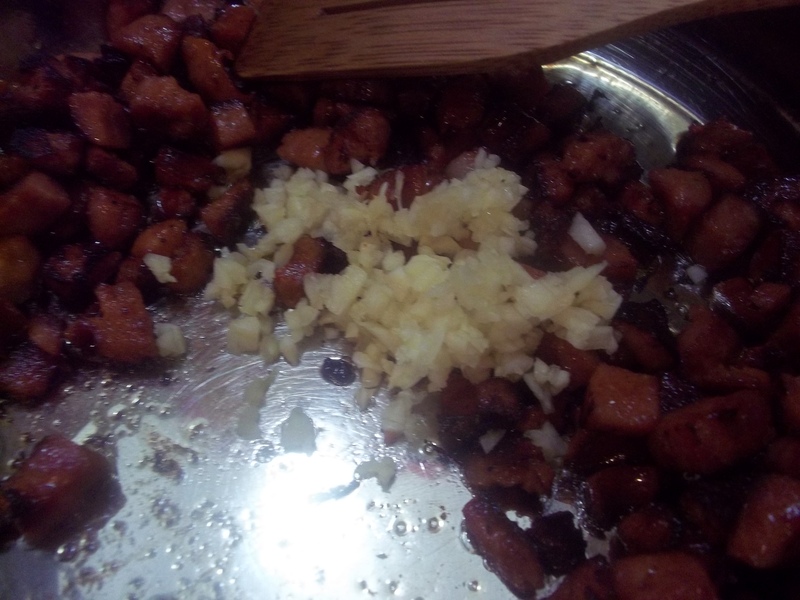 Saute garlic in sausage with its oils until translucent. 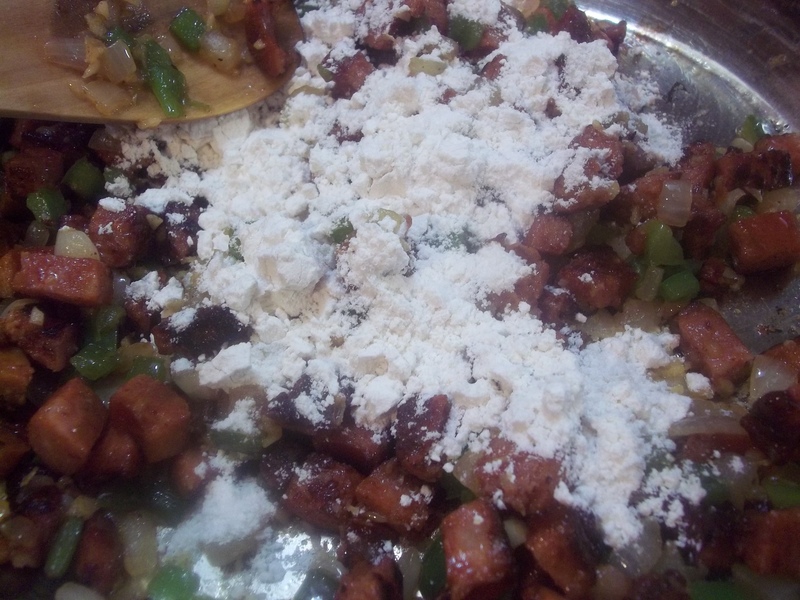 Add onions and bell peppers. 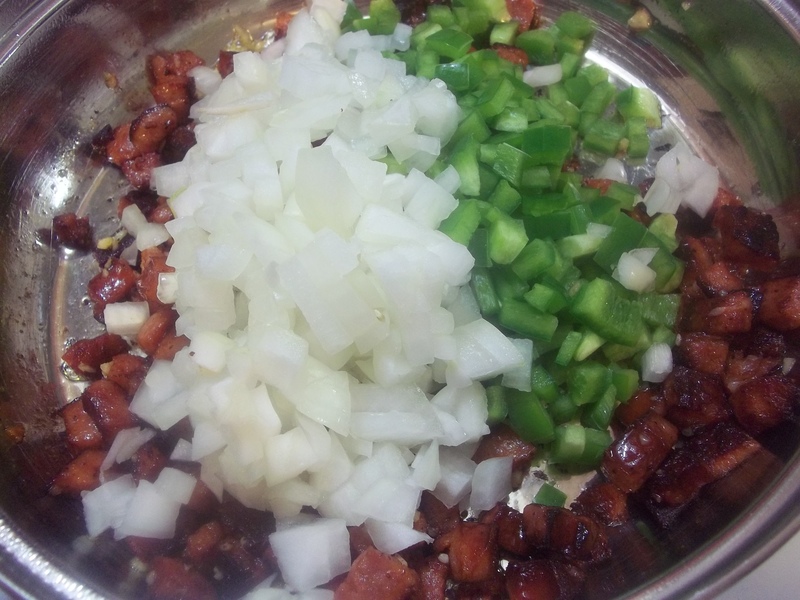 Continue cooking until tender. Sprinkle ingredients in pan with flour to make a roux. 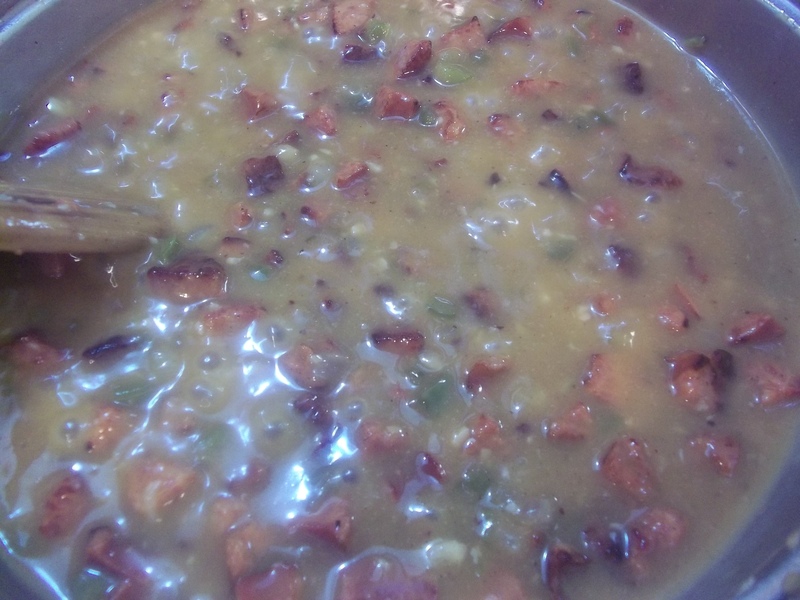 Cook, stirring constantly for 1 to 3 minutes to make a golden brown to brown roux being careful not to let it scorch. Stir in wine to make a paste, then add chicken stock until the roux is combine, stirring vigorously to a smooth consistency. 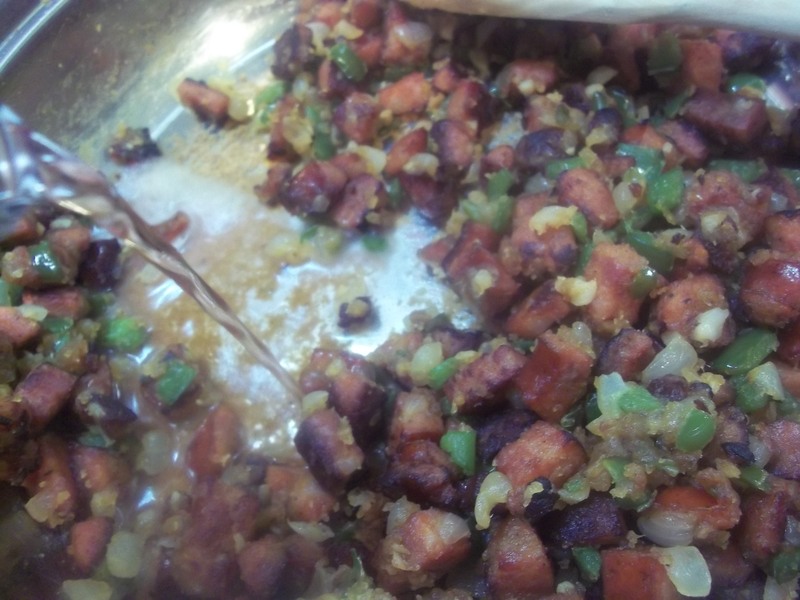 Bring to a simmer and continue cooking until thickened and reduced, stirring constantly. 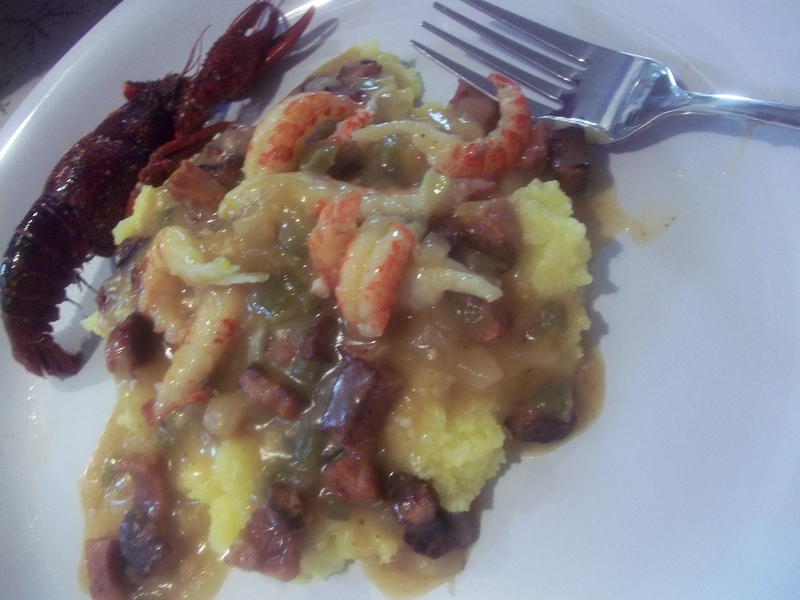 Add crawfish tails and heat through before spooning over a portion of grits. 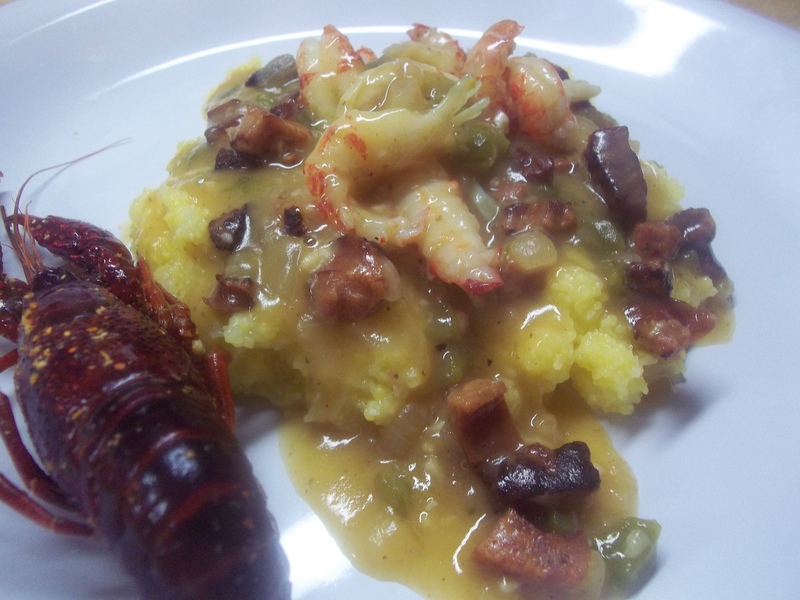 Note: Discard any crawfish that have uncurled tails. A curled tail means the crawfish was cooked alive, an uncurled tail means it was dead when it was cooked and will be unsafe to eat. Makes 4 to 6 servings.